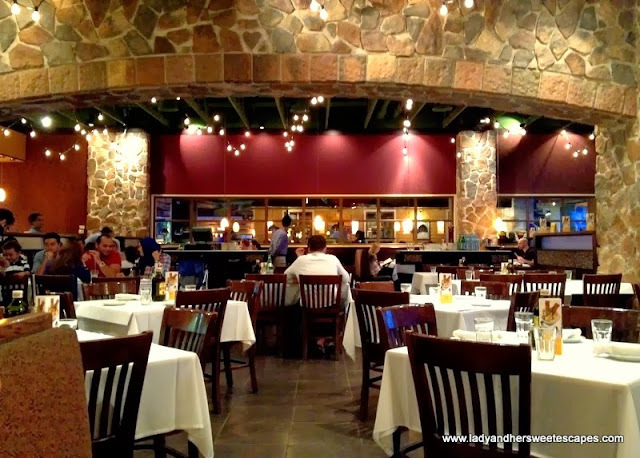 I love to discover hidden restaurants in a crowded shopping mall! It's always nice to have a quiet dining spot to run to whenever I don't feel like joining the clamor at popular food chains. You know, I get so impatient when I'm hungry. It's hard to wait for the reservation beeper to buzz when all I hear is the buzz in my stomach! 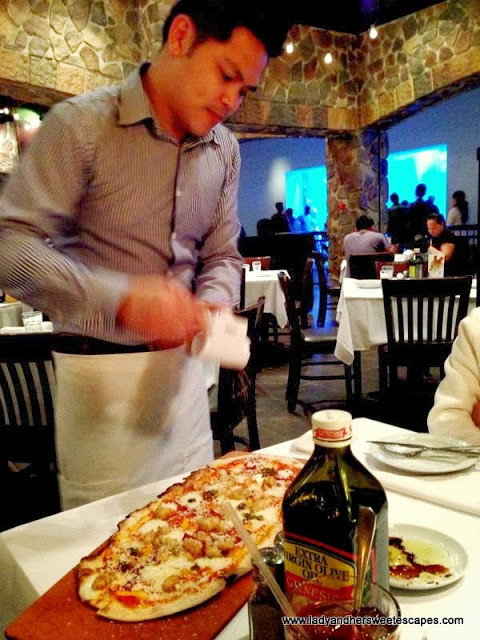 Romano's Macaroni Grill at The Dubai Mall is one of my favorite hidden gems! It is an Italian restaurant located at the first floor behind Dubai Aquarium, holder of the the Guinness World Record's largest acrylic panel. I bet a lot of people never noticed Romano's because they have kept their eyes on the marine animals at the aquarium or probably at the famous southwestern restaurant with a catchy 'spicy' name beside it. I have never seen Romano's Macaroni Grill full of diners. Woohoo for me! I know it's never because of the food, it's the location. 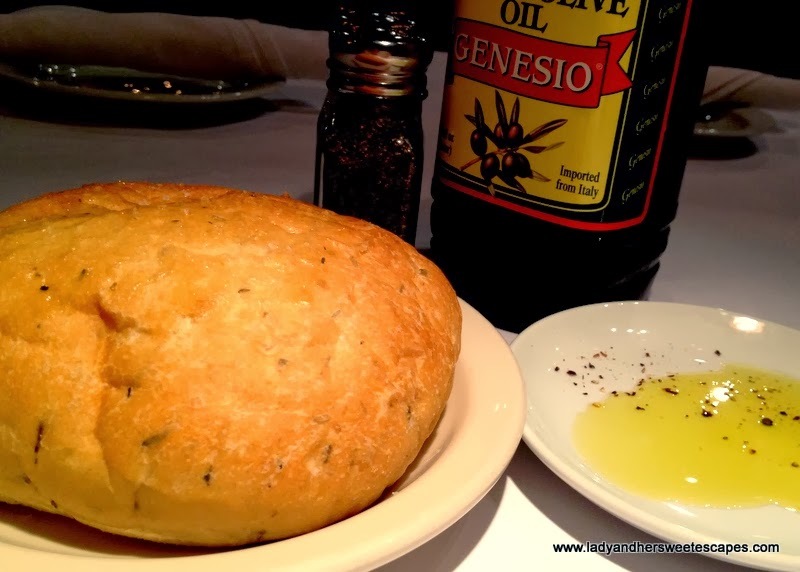 I love that I always get to be seated and served with a warm complimentary bread immediately. No signing up for reservation. No beepers. No waiting time! When orders are taken, Ed and I would doodle on the table. No, we are not vandalizing at all! 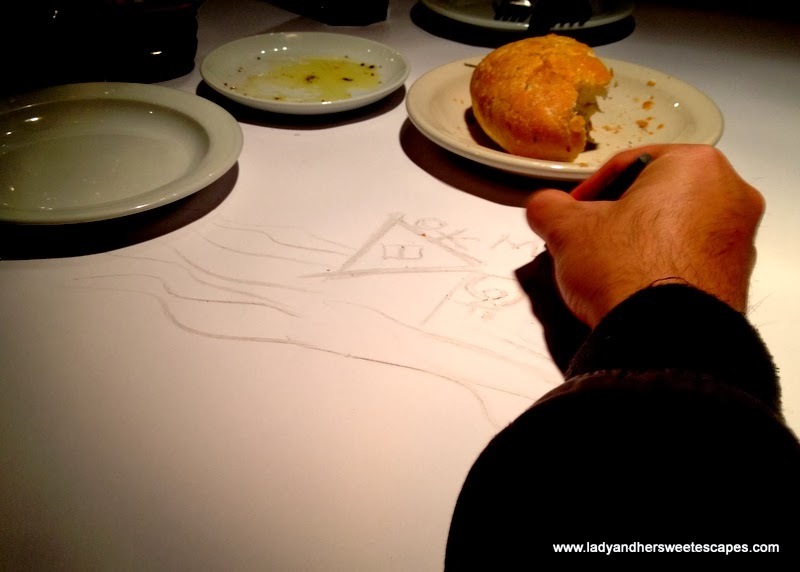 The tables at Romano's Macaroni Grill have white paper covers instead of the usual table cloth. There are crayons provided and the servers would also scribble their names on it before taking the orders. On our recent visit at The Dubai Mall, we brought our friends to this hidden restaurant. We were all craving for pizza and pasta, so it was the right time to use the buy1 get1 Entertainer vouchers! We had four main courses, but only paid for two! We chose Sicilian pizza from the Specials, a flavorful thin crust pizza topped with beef pepperoni, italian sausage, oregano, basil and fontina cheese. We also decided to have the Pasta Milano, a huge bowl of farfalle with garlic cream, roasted chicken, sun-dried tomatoes and button mushrooms. Since we were a group of five, we chose two more Italian dishes that are perfect for sharing. We got the Smoky Shrimp Flatbread; 10 slices of thin and crispy bread with seared shrimp, smoked mozzarella, veal pancetta and saporita on top. From the Pollo menu, we had the Pollo Caprese. 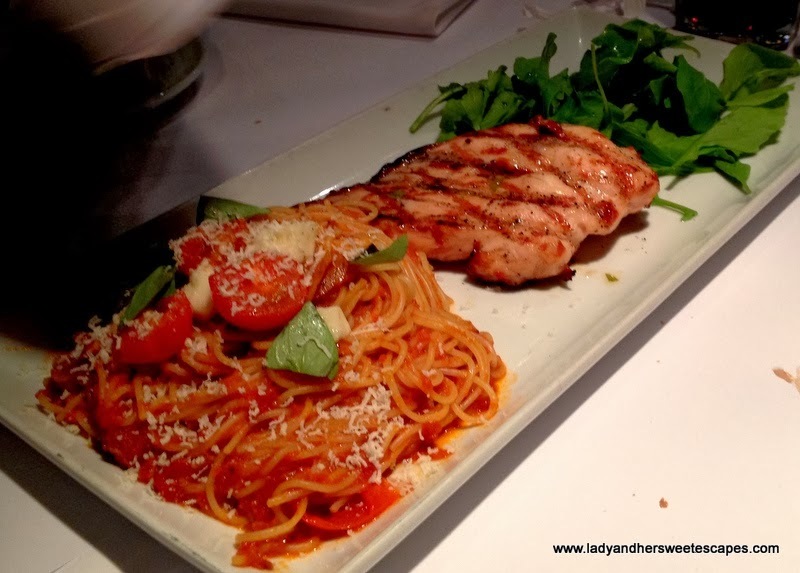 It has a good portion of grilled chicken breast, served with capellini pomodoro and arugula salad. Romano's Macaroni Grill has a cozy atmosphere suited for date nights. I just hope they would only play romantic love songs instead of pop music! It's also good for families and group of friends as the dishes are in generous portions. 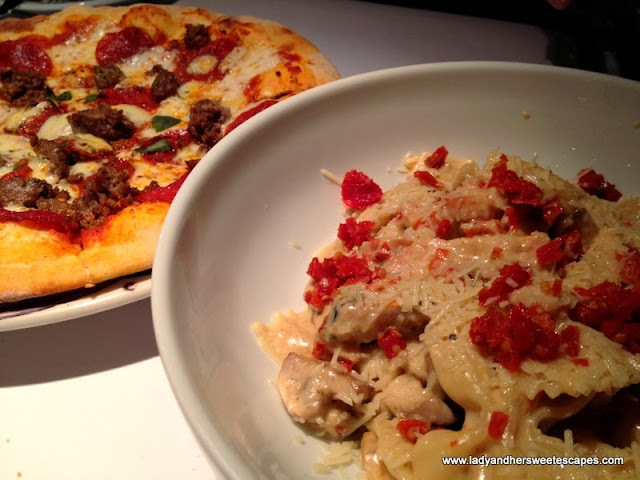 The four dishes I had recently were all satisfying, but it was the Pasta Milano that lingered on my taste buds. It differs from the rest because of the slightly spicy, cream-based sauce. So, the next time you'll go shopping at The Dubai Mall, search for my hidden gem! 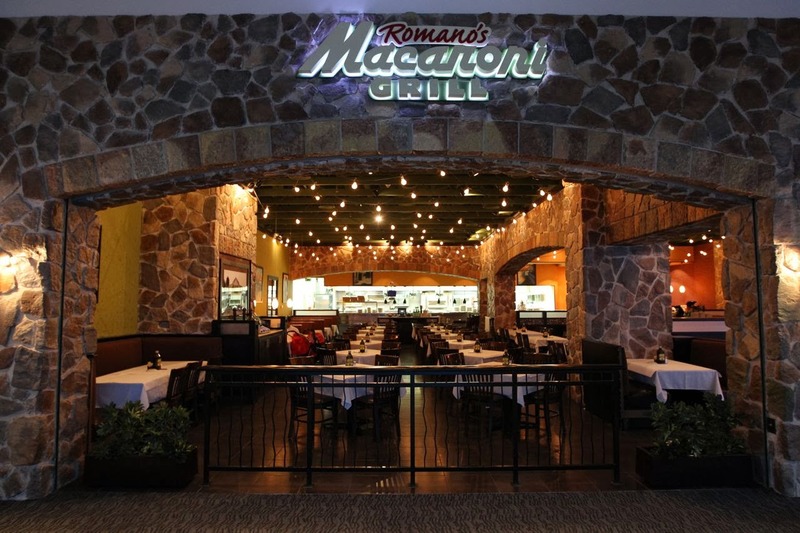 Head to Romano's Macaroni Grill and don't forget the Pasta Milano! Oh, and bring your Entertainer vouchers too. We got 106 AED off the bill! What can I say? As usual, you make me feel hungry. I love pasta and pizza e.
Sorry, Mommy Maye! :) Grab some soon. Dami palang restos dyan sa Dubai ha - I have relatives and friends there pa naman. :) I should visit sometime. Oh please do! Inform me ahead once you are planning to come. The pizza and pasta really look yummy. It is great that you get to doodle on the table too. The Pinoy in me converted the bill into pesos. Not bad for a group of five! Filipino staff are everywhere talaga noh? Those pizza looks so yummy sis.